HIGHLANDS  Workers for the Responsible Parties have been busy this week, and last, repairing the fabric and rock cap over the Waste Pits at the San Jacinto River SuperFund Site. This work is being supervised by the federal EPA, and project manager Valmichael Leos was on hand to watch. Leos was also one of the divers who discovered the missing fabric last December, according to an interview with the Star-Courier. The public is also watching. 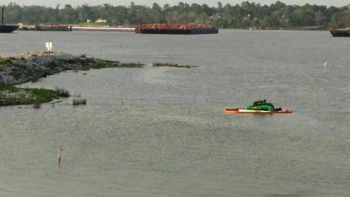 Jackie Young, of the San Jacinto River Coalition, reported to this paper on Tuesday that one of the bobcat tractors working on the repairs had been stranded when high water surrounded it. She was concerned that oil might be released into the river, but EPA project manager Gary Miller issued a statement on Wednesday saying there was no release. Miller said that repairs to all 5 areas of missing rock had been completed. Miller said that a mechanical failure caused the bobcat to mire in high water, but no oil or hydraulic fluids were released. An orange containment boom, seen in Youngs photos, was a precaution but not used. Workers are probing the East impoundment for the next three days, he said, testing the repairs. Starting in April, Valmichael said soil testing tubes will be inserted for a month, and additional dives will be made to insure the efficacy of the cap. Three security cameras, to be monitored off-site by a security firm, were being installed as of Tuesday. The firm will watch for potential damage, and for intruders or fishermen who will be removed from the area by law enforcement, according to EPA.